Preview images for the DC's Legends of Tomorrow episode "The Justice Society of America"
The second episode of DC’s Legends of Tomorrow Season 2, airing on October 20, features members of the legendary Justice Society of America! The episode is called “Justice Society of America” and you can see some pics below, featuring Commander Steel, Obsidian, Dr. Mid-Night, Vixen, Stargirl and more! Patrick J. Adams’ Hourman, last seen in the Season 1 finale, is also back. And here is your new Justice Society: Sarah Grey as Stargirl, Kwesi Ameyaw as Dr. Mid-Nite, Patrick J. Adams as Hourman, Dan Payne as Obsidian, Maisie Richardson-Sellers as Amaya Jiwe/Vixen, and and Matthew MacCaull as Commander Steel! UPDATE: We now also have an official description for the episode! Find it beneath the new pics. 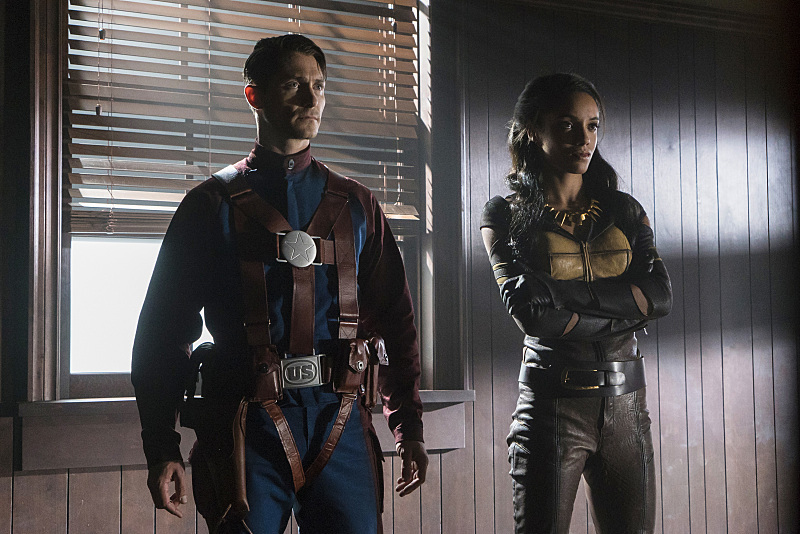 DC's Legends of Tomorrow --"The Justice Society of America"-- Image LGN202b_0061.jpg -- Pictured (L-R): Matthew MacCaull as Commander Steel and Maisie Richardson- Sellers as Amaya Jiwe/Vixen -- Photo: Katie Yu/The CW -- ÃÂ© 2016 The CW Network, LLC. All Rights Reserved.